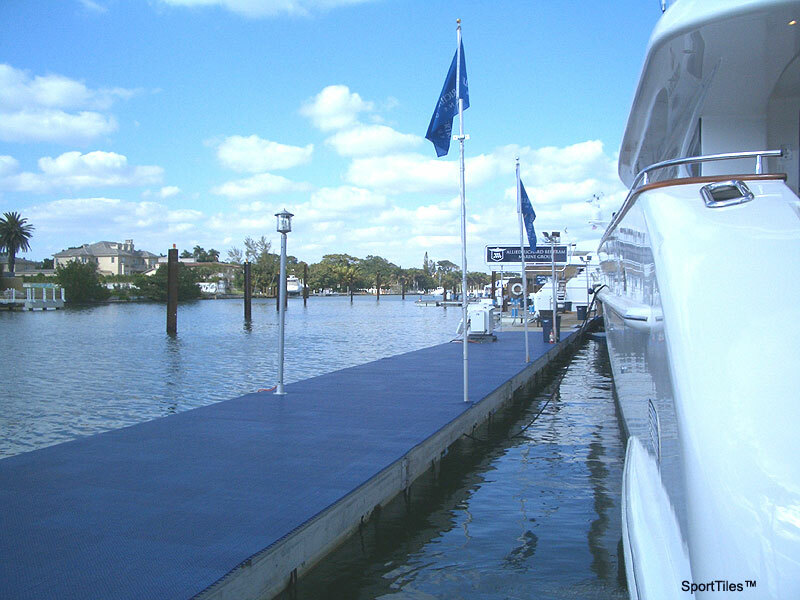 CWF's Flooring, Inc. boat dock tiles, swimming pool and outdoor decking tiles are water-proof, anti-slip & equally as attractive as indoor tiles. 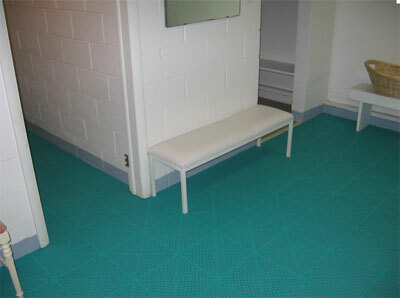 Our flexible plastic locker room and shower room tiles are soft on bare feet with superior water drainage. Comfortable and soft tiles are practical around spas & jacuzzi. Add safety and comfort to your indoor or outdoor wet areas. A must for swimming clubs & schools. 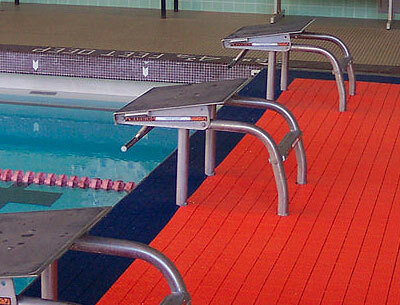 Anti-slip waterproof tiles will prevent injuries and lawsuits. Weight: .72 lbs./ sq. ft.
Six pastel colors to choose from. Colors are relaxing and refreshing and will make your swimming pool, jacuzzi or spa a place to recover the life's stress. 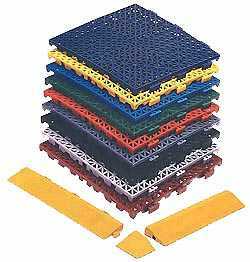 Flooring contractors are not needed to install, actually, snap together, the plastic deck tiles. 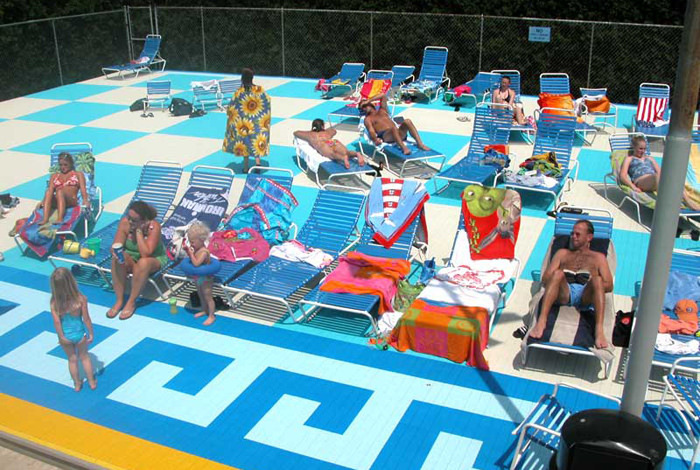 CWF's interlocking plastic tiles are anti-microbial and portable. If below tile access is needed for maintenance be assured this can be executed with ease. Water-proof tiles platform is raised and sits on 32 points per square foot. This enables easy water-flow below for consistent drainage. 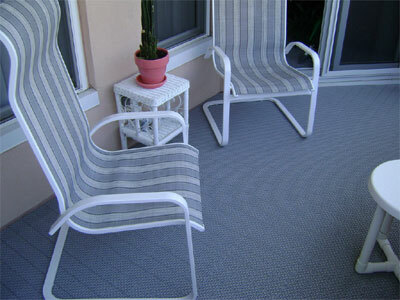 Beautify your patio deck with outdoor plastic floor tiles. Our SoftFlex swimming pool and spa-jacuzzi floor tiles are comfortable, anti-slip a 'legal' requirement for schools, public and private swimming pools. The six color options are refreshing and cool. Deck tiles are waterproof, anti-microbial and are easy to assemble, portable and have repair access to in-ground maintenance. When applied as a shower floor tile be assured that water will flow freely below your feet to enable a secure traction with bare feet or slippers. 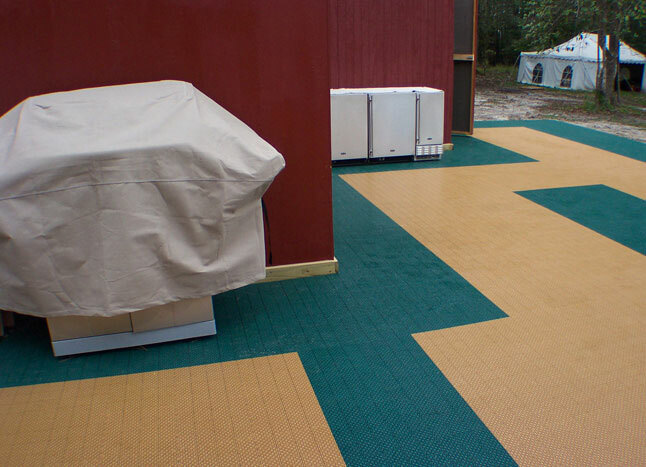 Floating dock floor tiles for walkways are UV resistant with positive foot traction no matter what type of footwear used. 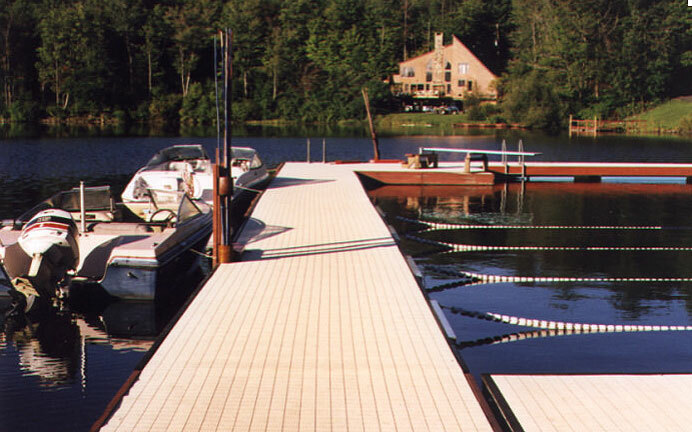 Plastic tiles for boat docks are a safety requirement for wet walkways. Dark color tiles will heat up more than light colors. Water-proof plastic decking tiles for your patio or deck will add functional beauty and safety to your family and guests. 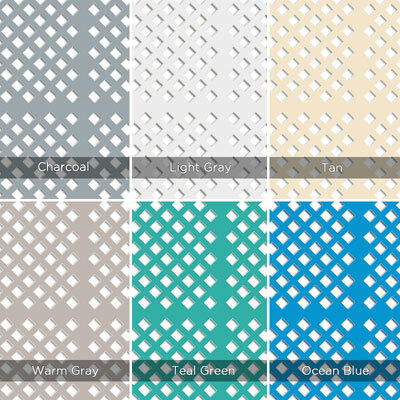 CWF Mats perforated tiles are ideal for creating a workspace that's clean, safe and functional. With a 1/4" hole, they're very easy to clean, as the perforations catch dust, dirt and other particles that are quickly removed with a vacuum. Indoor Use. 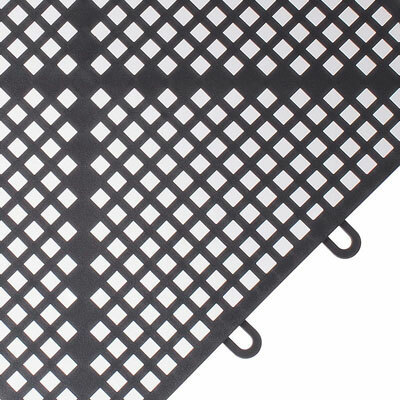 Our easy-to-maintain perforated tiles resist wear and tear. Resistant to shocks and most caustic products, our tiles are ideal for making boundaries for dangerous work zones. 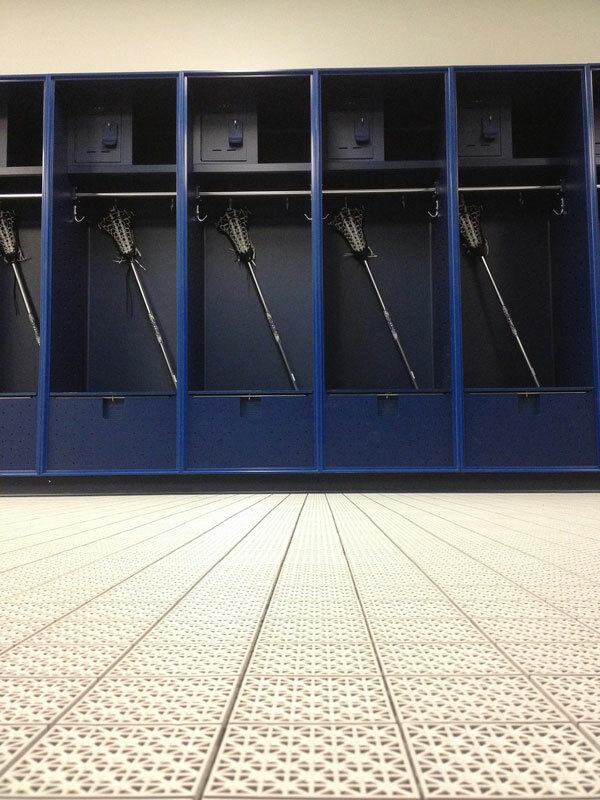 Water proof and anti-slip tiles are perfect for locker room floors. SPECIAL DISCOUNTS APPLY TO ORDERS OF 1000+ SQUARE FEET CONTACT US FOR DETAILS. 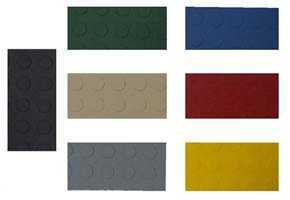 Tile & trim available from stock in Black, Blue, Burgundy, Green, Terra cotta, Yellow & Gray. *Other colors available upon request. Minimum order is 20 tiles. 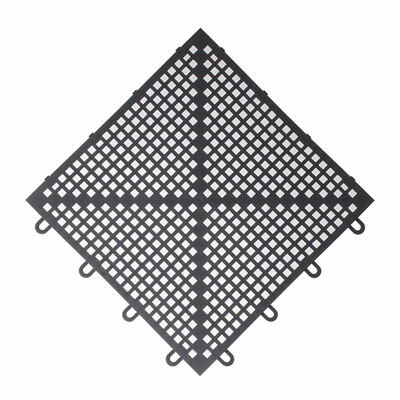 Perforated Tile 12" x 12" x 3/4"
Corners 2-1/2" x 2-1/2" x 3/4"
Female Trim 12" x 2-1/2" x 3/4"
Equal # of M/F required if edges encircle floor area. Male Trim 12" x 2-1/2" x 3/4"
Saunas, Whirlpool Areas, around Swimming Pools and Showers. The Multi-Lock plastic decking tiles are interlocking, have indoor application and are easy to clean that is almost stain-resistant, portable and economical. 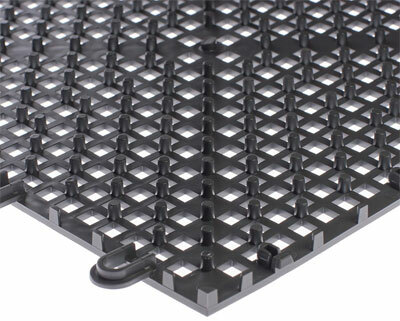 The Multi-Lock plastic interlocking tile tabs are pushed securely to snap lock the interlocking tabs together. The effort is so simple that this can be accomplished by hand, without tools. However, a small rubber mallet is recommended for efficiency. Beveled edges and corners accent the perimeters with a precision border. 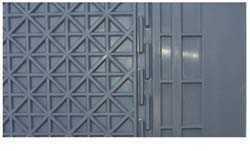 Now wonder the Multi-Lock plastic interlocking tile is used at the corporate headquarters in Palmdale, CA. 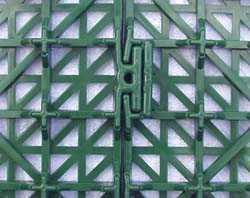 The interlocking tabs are not seamless but are smooth and level from tile to tile. 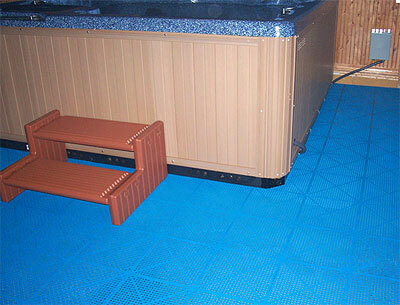 Hence, the popularity is using the Multi-Lock plastic tile for indoor roller blading and skate boarding flooring. Skateboard and roller blade flooring is not the most common application, rather the most common application is for office and warehouse flooring. 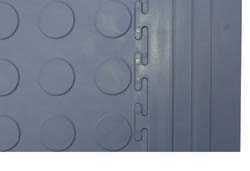 The interlocking tabs or jigsaw-like connectors make the design attractive for industrial flooring and basic office floors. 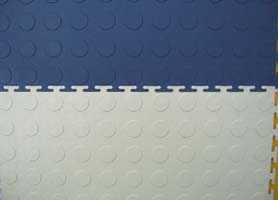 So durable and dense that these interlocking tiles can be used for garage flooring. Black, Green, Blue, Beige, Red, Gray, Yellow and White. Manufactured from rugged and resilient PVC, Multi-Lock is an injection molded solid vinyl tile. A modular replacement floor system that quickly restores and enhances surface appearance hiding unsightly stains and minor cracks in concrete floors. Whether in large Industrial sites or smaller public spaces, Multi-Lock offer rapid surface installation and exceptional durability in high traffic or heavy load conditions. Modular, "loose laid" interlocking floor system allowing for a quick and easy installation requiring no special tools or messy adhesives. Resistant to most harsh chemicals including gasoline, engine oil, anti-freeze, road salt and most solvents. Provides an anti-fatigue surface and reduces cold vapor diffusion for a more comfortable walking or work area. Minimizes plant "down time" during installation. Modular portability allows for easy replacement of damaged tiles or relocation to alternate site. Can be custom cut to fit using a stiff sharp knife, jigsaw or circular saw to adapt to any angle or contour during installation. Ramp edging in matching colors available for entrance ways or edge finishing. Other options include rubber portable and rollable mats. Each tile covers 2.60 sq. ft. Thickness: 5/16" or 3/16"
NOTE: TO DETERMINE THE NUMBER OF TILES NEEDED DIVIDE 2.64 BY TOTAL SQUARE FEET NEEDED. EACH TILES IS 2.64 SQ. FT.
A $7.50 credit will be applied for samples ordered below if a purchase is made.